A paperback version is coming soon, too. 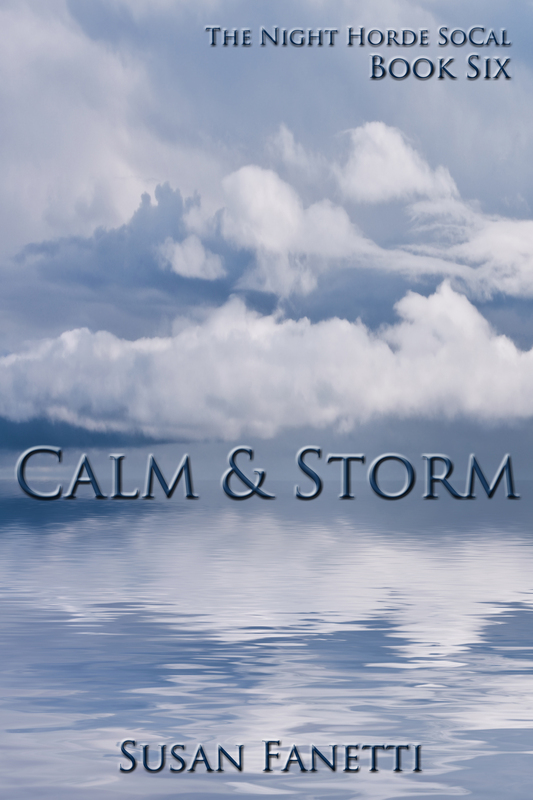 Normally, on release day, Susan has a teaser prepared for her next book, but as Calm & Storm is the last Night Horde SoCal book, and she has no plans to release another book in 2015, we don’t have a teaser to share today. Instead, we’ll let you know what’s on the horizon, at least as far as we can see at this point. First, to answer the question that gets asked most often: Yes, Nolan will get a book. It will be a standalone inasmuch as it won’t be part of any series, but it will be strongly informed by both series he’s been part of. We haven’t written it yet, but we anticipate that it will be released about the middle of 2016. In the meantime, we have a first draft done of what will be the first book in a short historical romance series, set in a Viking world. Oh, LORDY, was that fun to write! We’re planning to release that in January. And fans of the Pagano Family series might be interested to know that we’re currently writing John’s story and planning a spring release for that. I expect to make Susan write Joey’s story, too, and close out the Pagano series in 2016. So Susan is still writing, and I’m still torturing her when she doesn’t. We likely won’t be releasing every six weeks any longer, simply because that pace is wearing me out as much as her, but we won’t make you wait overlong. Enjoy Calm & Storm. I had big fun with that one. Got CALM & STORM and I’m going to savor reading it….won’t read it until I read the two books ahead of it. I’m sad it’s the last but grateful for the series. Looking forward to what’s next and glad you’ll take the pace a bit slower……HOPEFULLY……another MC Series down the road somewhere…….Thank you! Bittersweet, knowing that his is the final Night Horde book. I didn’t think it’d be possible for me to cry harder than when I did while reading about Havoc. I was wrong. The epilogue to the series, *sigh*, like I said: bittersweet. This series will definitely be one of my favorites, forever. Susan you have a gift for writing books that I don’t just read I feel. This book was fantastic. I have never cried as much while reading a book before. I think that is because they are so well written that the characters feel like old friends. The Night Horde books are wonderful and I recommend them to anyone who ask for a suggestion on what to read.